May Recap + A $100 Visa Giftcard Giveaway! Hi friends! Well, it’s the first Friday of the month and you know what that means, don’t you? It’s giveaway time! Yup – in case you missed it last month, I’ve started giving away a $100 Visa giftcard each month in effort to show you all just how much I appreciate you. I’ve made it super easy for you to enter! Leave a comment on this post and then simply log into the Rafflecopter button at the bottom of this post. After you’ve commented, click “Leave a blog post comment” on the Rafflecopter button, then be sure to click on “I commented!” so that your entry will be registered. The Rafflecopter button can be found at the bottom of this post. Now, for a little look at what I was up to during May. Click on the title above each photo to be taken directly to the post. May was a fun, but busy month. I’ve spent some time working on my dining room and getting my red, white and blue on. There’s more of that to come! Now onto the giveaway ! Remember that entry is easy! Leave a comment on this post and then simply log into the Rafflecopter button below. After you’ve commented, click “Leave a blog post comment” on the Rafflecopter button, then be sure to click on “I commented!” so that your entry will be registered. I would use the gift card for groceries, other needed things. I would use the Visa card to buy some vintage “finds” to achieve the “fixer upper” style I so love. I get your newsletter but didn’t know you had a blog as well! Wow! The grilled shrimp taco recipe looks wonderful and it’s so easy! I just printed another shrimp taco recipe a few days ago, but yours is better! I would use the $100 gift card to stock my freezer when Harris Teeter has their B2G3 Shrimp offer! I would buy new bed linens which I am so in need of! Shrimp tacos were delicious. Love your dining room style. Using your ideas for our Fourth of July party. I would love to win the Visa gift card. I love your blog and have been following you for a while! I am so glad I found your blog! I love your decorating style. You have inspired me to get some house Updates going. Thank you for the opportunity! There are so many things I could use it for, but I think I am going to go with my elder daughter’s senior pictures. I am really excited about them. I would love to purchase a potting bench for my yard! I would love to win! I love your blog! What a lovely and generous gift! I definitely would use it to enhance my outdoor space!!! Happy to have found your blog last week. Wonderful inspiration! Loved the shrimp tacos from last month. I’m planning on updating our bedroom and the gc sure would come in handy. Thank you!! I would use it for a new rug for my sun room. Thanks for the opportunity! I could definitely use $100 to put towards materials for all of the crafts I am now inspired to make! Love your style and love your ideas. I would use it to buy a playhouse for my daughter. I love your blog and decorating style. Feels like home. Thanks for your generous give away. It’s awesome! Love your blog, thanks for the opportunity to win. Everyone can use extra. I love the grey/silver chairs in the dining room and the floating shelves are so neat. What a fun contest! Love your dinning room and decorating ideas throughout the year. Thanks so much for a lovely blog. I really enjoy following you! Thank you for doing this. I would take advantage of seasonal sales that are going on right now to stock my freezer. Thank you! I’m going to try the grilled shrimp tacos. I would use the gift card for some improvements I’m doing in my house. I LOVE your blog, Suzy !!!! I would definitely take advantage of some of the great items available for me to “boost ” my home décor. Love what you’ve done to your home…thanks. Thank you for the chance to win a gift card. Have a wonderful weekend. Take care. I’ d love for you to do a tutorial on how you touched up the gate wall decor above your fireplace! I love your blog…you are so inspirational. I love your style! I look forward to seeing the ideas you come up with! Wow! Love free things! Gift cards are awesome! Enjoy your blog. Love the recipes and garden tips. love your blog, shrimp tacos are yummy. I would use it for Fathers Day! I love your dining room. I have gotten several ideas from your blog! Thanks for being so creative. I love your blog! You offer so many fun crafts and decorating ideas! Thanks for sharing! Love your style and your blog! Thanks for sharing. I would use the VISA Gift Card to purchase some more blue & white planters. 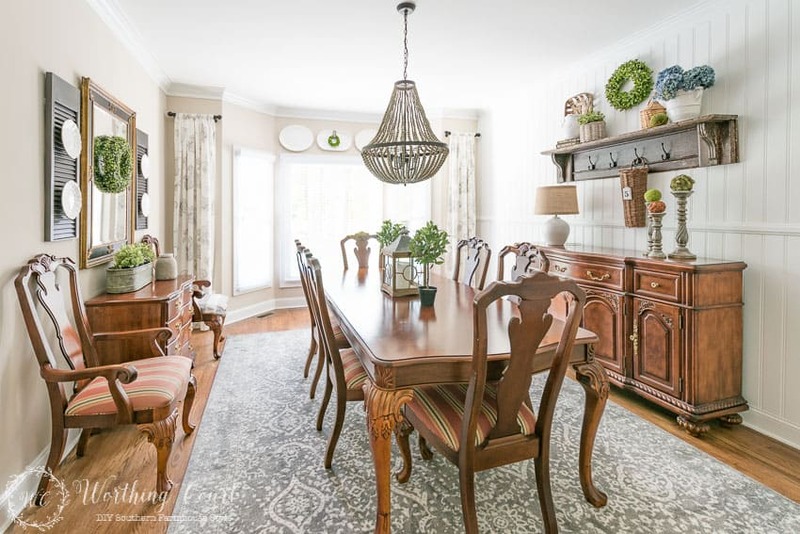 Your Dining room is beautiful, love the style! I am enjoying the dining room makeover. I like the new rug you have selected. Look forwar to more updates. Your article on Greenery in the house is something I have to work on!. Since we are moving into a new house, I will definitely need some! Thanks for the information….and the giveaway! Love your blog! You did a fabulous makeover on your dining area! Love your ideas! Love your ideas! The shrimp tacos look yummy!! Hi Suzy, I always read your blog! Love your style of updated traditional/french/farmhouse. Thank you for the opportunity to win a gift card. Love the shrimp tacos! perfect meal for these hot summer days in Arizona! Thank you for the recipe! Hmm… I would probably get a few pretty things for around the house, maybe a new lamp. 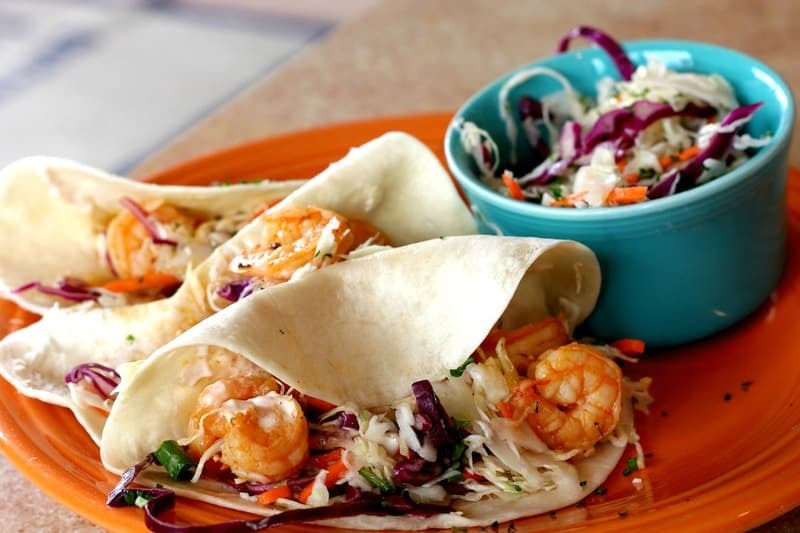 The shrimp tacos look yummy…will have to try them out sometime soon. The seed packet wreath is so cute. Such a nice giveaway…I would probably spend it on something for outside entertaining by the pool. Thanks for the chance to win! Would love to win the Visa gift card!!! Your dining room turned out beautiful! I’m going to have to try those Grilled Shrimp Tacos. Love your blog!!! I enjoy all your post but especially the simple ones for a patriotic theme. If I won the $100 I would pay for more things I need to add to the blog I am starting and almost there but just need a few more things added. I am very much in tune with your style of décor. Great inspiration. Your blog it’s incredible! Would love to win the gift card!!!! How exciting. Perfect for vacation time. Happy June! I would love to win the gift card! I will donate it to the miniature Schnauzer recuse group AI like to volunteer with. I love you dining room makeover with the beautiful rug. Also, would love to win the $100 too!! I need new glasses and would use the gift card toward these. Thanks for the opportunity. Love the seed packet wreath. Love your blog, you have great ideas and a beautiful house. I would love to win 7 buy a new quilt for my guest room. Thanks! Thank you so much for the giveaway! I get so many wonderdul ideas from your blog. I would use the $100.00 to pretty up my porch for the summer. What a wonderful giveaway! If I was lucky enough to receive a gift card, I’d save it for my pup’s teeth cleaning. I’d love to use it for something fun around the house, but with the cost of teeth cleaning for dogs, it would go to a good cause. If I was so lucky to win the gift card, I’d treat my son and daughter in law to a great dinner. I use the money to fund a weekend escape to my BFF’s cabin on the lake! We’d spend the weekend antiquing and eating fried green tomatoes in our favorite little country cafes. Total bliss! Hi Diane. I chose not to put a coat of poly on my shelves as I wanted them to be very rustic looking. However, if these’ were shelves that I use everyday (taking things down and putting them back) then I would have added poly to protect the finish. Just lost 30 lbs. and sure need some new clothes! Absolutely love what you’ve done in your kitchen! I love your Red White and Blue items! It says ah shucks did not get your entry. What did I do wrong? Hi Rebecca. 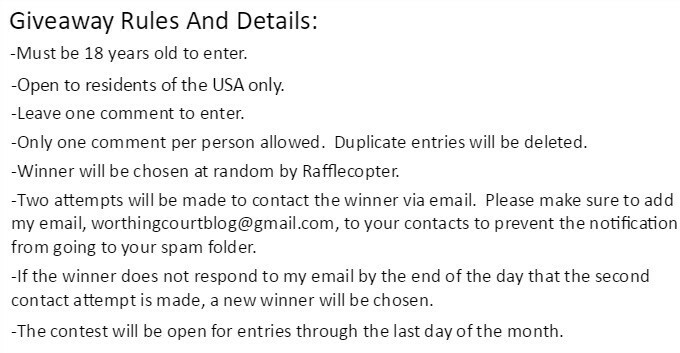 I’m not sure why you weren’t able to enter, but I added your entry manually. I love your blog and your decorating style!!! Thanks so much for sharing your home with us! I would use the gift card towards making new curtains for our new house we moved into recently. Thank you! HI, Suzy! Thanks for the generous giveaway. As you know I’m having fun with my whole house makeover; one room at a time, lol! The gift card would sure come in handy! Good luck, everyone! I love what you have done with your dining room! I have been working on mine, and it’s fun keeping the elegant Williamsburg feel with the updated fabrics and lots of blue and white! I would use the gift card to buy fresh flowers every week for as long as it lasts :-). I’ve recently moved and home decor is at the top of my wish list. Winning would help me accessorize our new home sweet home. Take my hubby out for his birthday. He had heart surgery a year ago July 30th. Doing well, but we need to celebrate. High School Sweet Hearts. Very excited to win a gift card!! I’m enjoying your blog! I am a new subscriber to your blog and am loving your posts! I would give the gift card to my husband. He has been wanting a compound bow for awhile now. Right now money is holding him back… he would just love the help of a gift card! I have really enjoyed your blog since finding you from Pinterest! Thank you so much for the chance to win such a wonderful prize! I love your blog! I always get great ideas here. Thanks for doing this great giveaway! I would use the $100.00 to try the yummy shrimp tacos recipe and buy something special decorwise. Thanks! Thank you so very much for such a sweet and generous giveaway opportunity! And I just love your gorgeous dining room! I love the way you decorate! Very inspiring! Your dining room is looking very pretty. Thanks for the opportunity to win $100. I would probably use it to throw a party for my family this summer! I plan to make the beautiful, clever, but easy patriotic ribbon banners for the offices at my work to share all around. I would use half of the $100 to give to the Salvation Army to help with their help the homeless program and the cooling stations that they provide for senior citizens who do not have air-conditioning in their homes. I would take my husband out for date night. I’ve just started following your blog and just love it! Can’t wait to read and learn more! We moved in our current home about 12 years ago. Hubby got his acreage and fishing lake, I got my white sided country home with wrap around porches. He retired and I planned to keep working, because boy did I have plans to put my stamp on this house. However….life stepped in. Cancer, treatments, multiple surgeries, permanent mobility issues and early retirement changed my decorating time schedule…by years. (Not complaining, I am truly blessed.) So I am slowly gathering ideas (that’s where you come in as your blog is one of my favorites for inspiration). And I’m slowly gathering my old items to recycle and new items to use (and that’s where the money will come in if I’m fortunate to win:) I love your home and all of your projects/ideas. Thank you for sharing. Enjoy your blog, read it as part of my daily routine. Would use the gift card for some type of home decor item. I would share the gift card with my daughter. She just bought a new home and many things she could use. Thank you. I would buy some craft supplies as I am running low. Thank you for the opportunity to win the much needed gift card! I love your dining room its decorated beautifully! We are ehaded out to the Outer Banks for a week with all our kids and their families. This gift card sure would be well used! I’d put it towards vacation! I would probably buy something for around the house. I would buy a massage table. I love your dinning room. I would use the gift toward a new rug. I enjoy reading your blog! Thanks for the giveaway! I would buy new beautiful towels for a recently remodeled bathroom. Thank you for your generous giveaway. Love your blog! I just love your blog. would love to win the gift card. Nothing fancy but I’d use the gift card to buy groceries. I enjoy your decorating and your blog. keep up the good work. I subscribe to your newsletter and follow your blog. I’d buy some dirt and seeds for my garden. I love spending my time outdoors now that the weather has warmed up. I would use it for some new toss pillows and a throw! I could use a Visa card to do a lot of decorating. Thanks so much for the chance. Thank you so much for the wonderful giveaway. I just love your blog. You have me loving greenery in every room. I love your posts and will continue to read and learn from you. Thanks again. I would get swimming gears for the whole family. I love your blog and I would love to win the Visa card to do some of the great ideas you share. I would probably buy some red/white&blue fabric to make cute stuff. Love your very original, creative ideas; not the same old run-of-the- mill ones seen on so many blogs…same old boring ones. Thanks for sharing with all of us. I would buy paint to start a guest room redo. The shrimp taco’s were a hit with the family and I love your dining room. I love everything about your decorating. I would go garage sale shopping with the money to look for accessories to decorate with. I love to repurchase and redo items for my home. I would use it on groceries for our beach trip! I would use it towards meals on my next vacation. Thank you for the opportunity to win the Visa card. I would use to buy paint and stain for my home. I would put it toward buying an area rug for my dining room! I love the one you put in your dining room! Your dining room is so pretty. Thank you for this giveaway. Also, I will try the recipe for the shrimp tacos–they look so yummy! Thank you for the reminder that the 14th is Flag Day! Happy Summer! Your home is so beautiful! 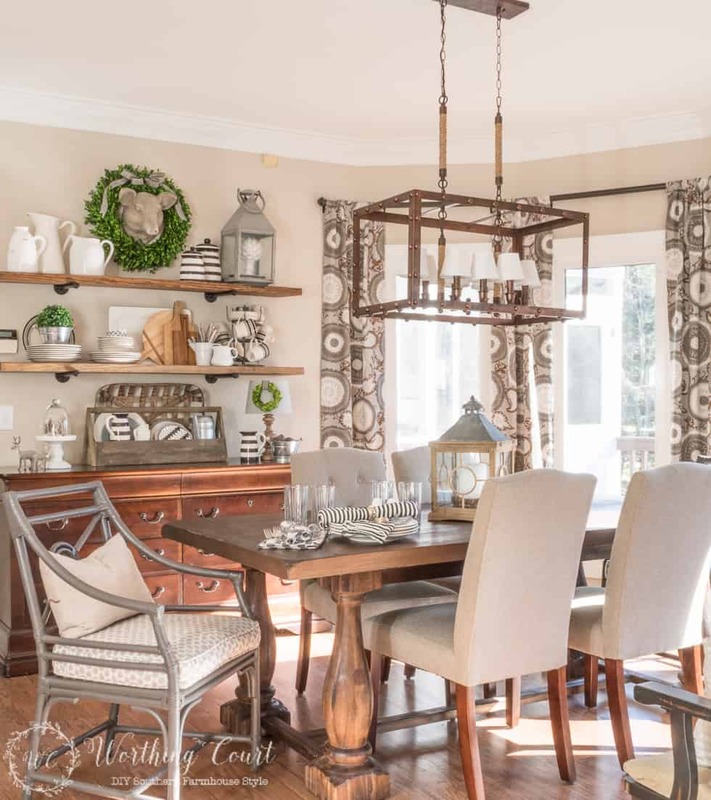 I love your dining room makeover….such a pretty space! I would use it on patio accessories!! Love to read your blog! Would use the gift to decorate my home. I would use it to purchase new curtains for the spare bedroom I’m redecorating. I’d put it towards a couch, we really need a new one! My hubby and I will go out for our 50th anniversary! Thank you! I thank the internet and social media for helping me find blogs like yours! We bought a home in December and have been redoing/adding additional square-feet so while I have been impatiently waiting, I’ve been planning on what I want to do decor-wise. I love anything and everything farmhouse and after spending time on your blog; I am FULL of ideas. So thank you for being you, and sharing. I dig the scoop. I always enjoy the creative dyi s on your blog. I enjoy your blog and all the ideas you share. I love your banner and plan to get the supplies next time I’m shopping. I would use the gift card for some new things for my deck. You are very generous. I would go shoe shopping! Fantastic opportunity! Thanks for your generosity! Thank you for your refreshing blog! Hope I win the give-away! Your new dining room rug is gorgeous. I love it. I probably would use the $100 gift card to buy new bedding. I would take my hubby out to dinner for our 50th anniversary. Thank you! I would take it on my cruise to Alaska! We remodeled our back deck last year and I would use the gift card to get some nice metal decorations for the area. I’d put it toward some curtains for my bedroom. 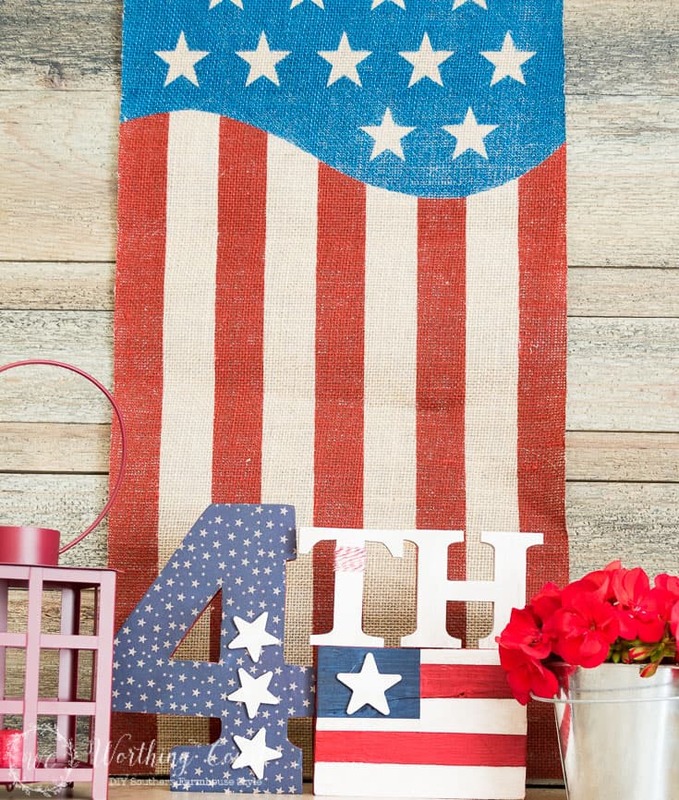 Love-love-love your Fourth of July crafts! Especially the no sew banner! Happy Summer! I would buy pet food! I would use the gift card for craft supplies for wedding decor! I would buy food with it if I won. I would use it towards back to school shopping. Thank you for the chance! I would use the gift card toward my youngest sons birthday next month. I would buy supplies to make some new kitchen towels and pretty pillows! We really need to redo our deck so I would probably use the gift card to buy some of the supplies we need. I would put it towards our summer road trip to Port Orford and I hope to get one more in, to bring my son to The Enchanted Forest. thank you so much for the chance. I would use it to buy my kids bathing suits and take them on a mini vacation. My niece is going to have a baby any day so I’ll buy them some gifts. I’d get some skincare, as I’m super low right now. I would use the gift card towards our guest room makeover. Thank you so much for the chance to win! I should say my children, my home, my parents, my siblings, my friends, etc… but I am going to be selfish and say myself. Life has been a little hard lately, so I’d love to unwind with a nice massage. Thanks! I think I could have a nice party for the 4th with prize money. I would use it for a family get together. I love having family over and making my house warm and inviting for everyone who will come! Thank you for this opportunity to win a giveaway. I would either use this visa to buy us a nice dinner or accessories to touch up around the apartment. I would make a dinner to celebrate all the birthday’s we missed this year due to ill health. My husband was in the hospital for over a month and we did not know if he would survive, so I did not get to give him a birthday party, nor did we make Thanksgiving. We got out just a few days before Christmas and were too exhausted to do anything at our home. Then we went to our daughter’s house for Christmas Eve, but her kids were sick and threw up, so we went home with no dinner. I would like to celebrate everyone’s birthdays we missed. Thanks for the giveaway! i thought I was already subscribed but maybe not. I need a new laptop so I can enter giveaways without running into all kinds of problems. I would use the gift card for “mad money” so i could put some of your ideas into action. Shrimp Tacos for friends and neighbors! Yummmmmmm! Thank you for sharing this giveaway with us. The red white and blue ideas are awesome. I’ve watched your blog blossom over the last couple of years. Good job and it looks like you’re having so much fun doing it. Kudos…..
i would use the gift card to get my hubby a new grill. Thanks for the opportunity to win! Thanks so much for the chance to win! Fingers and toes crossed! I would love to win the gift card! Thank you for your uplifting blog! I love your blog! Great styling in your house for sure! Just discovered your blog. Would love to win the gift card! Thank you, for your inspirational Blog, love reading it each day! I would use the gift card to buy beautiful things to the new home I am moving to this month. What great ideas for the Fourth of July. Thanks for the chance to win. 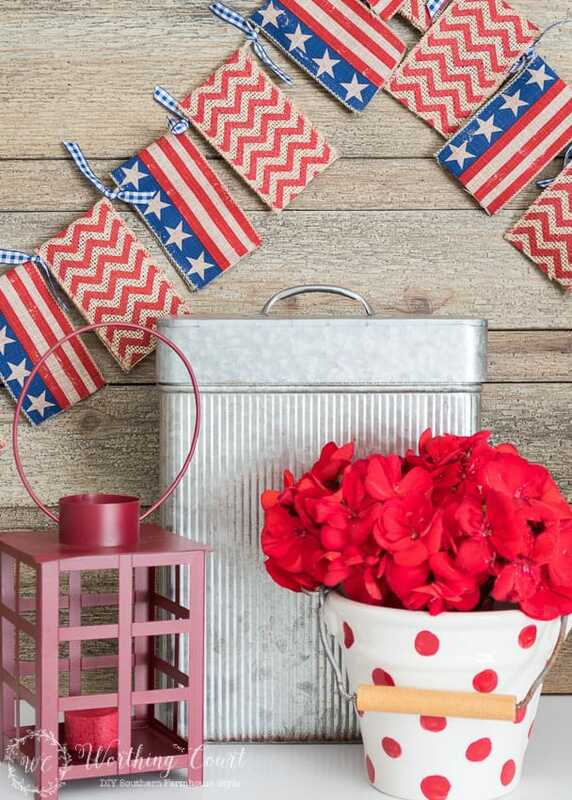 I would love to win and spend it on 4th of July décor. Specifically a new flag. I wouldn’t though. since I need so many other practical things this summer. Thanks for the giveaway! I would use the gift card for a shopping trip to HomeGoods. It just dawned on me that you be the Worthing Court around the corner, if you’re in Greensboro. Weren’t you at Total Bliss? Hi Linda. Yes, that’s me! Love your blog. Could use the Visa card for vacation coming up. Thanks for the opportunity. Love, Love, Love the Seed Packet Wreath!!!! Your breakfast room is so Pretty as well!!! Most likely would have to use it for everyday expenses since I am due for eye surgery and trying to be very frugal right now. love the seed packet wreath…great idea and simple! would look great next to the garden and thanks for the giveaway! Those grilled shrimp tacos look delicious! Thanks for the opportunity! Would use it for some summer DIY projects! The shrimp tacos look great. The $100.00 would probably go towards bills. My head is spinning with ideas for the $100 Visa gift card that you are so generously giving! I first thought of starting a *fund* for a decorative storage piece (w/a farmhouse look), but so many fun and/or unique things have been mentioned, I’m doubting my plans a bit now! Just please know that if I am chosen, that card will definitely be very useful, and most appreciated! I love the Flag Banner, and hope to make it for one friend who keeps an Americana-themed room year ’round … and another who has a birthday near July 4th! They will both love it, too ~ so thanks again! So cute – I want that banner for my July 4th barbecue . Love to read and view the Scoop. If I won the gift card I would use it to purchase some flatware that I’ve been wanting. Such a generous giveaway. I think I would use the Visa card for some new table linens. I’d use it towards redecorating the kids room. I would use the gift card for a nice dinner on vacation. Thanks for the chance to win! i would probably use the card toward something for my son’s new-to-him house. Hi, Suzy, your porch is delightful. Our long, narrow porch already has similar metal chairs with table, as well as a large flying flag, lantern, and potted annuals. All that is needed is closer proximity to A Home Goods store to complete your patriotic look. Thanks for the inspiration. Cooking book, backpack, and flashlight because you never know when the light will go out! Your shrimp tacos look amazing! I’m at the beach right now and this will be perfect for a dinner. The 4th is my favorite holiday! God bless America! 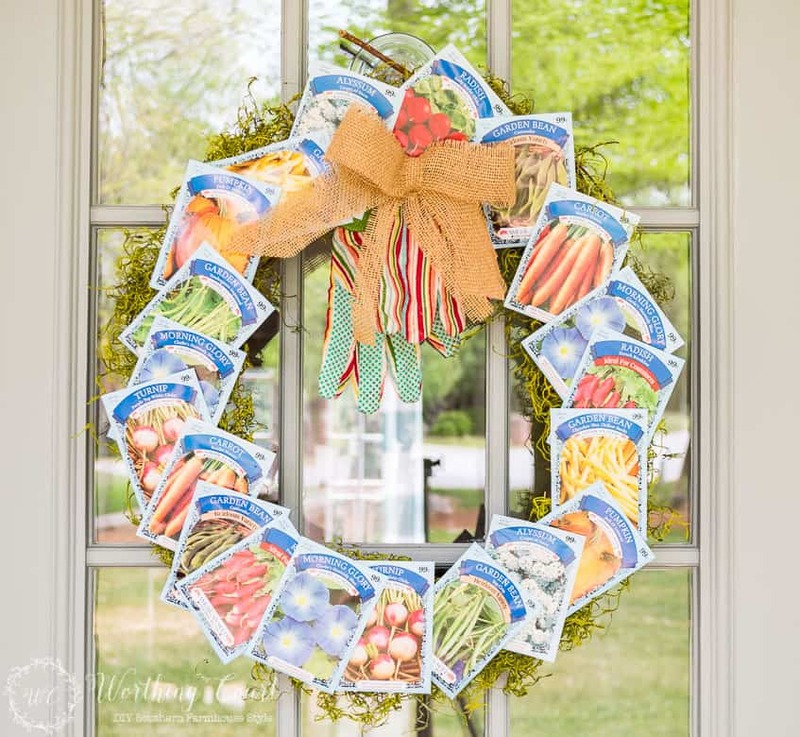 love the seed packet wreath…great idea! All my money goes to the care of my cats. I have 13 elderly cats, that seem to live at the vets. I would love to put it toward a new coffee table. I would use the gift card to go thrifting. I have a new house to decorate! Your home is lovely and inspirational. Thank you for the opportunity to win. I really need a new bed, so I would put the gift card towards that purchase. thanks! Thanks for the opportunity! We just moved info a new home, so there are lots of things we need, but I would probably spend it on a painting or piece of art, around which we could design the living /family room. I really want new bedding for my bedroom. My current duvet cover is dark and I grown tired of it. If I win, I would put the gift card towards a brighter bed set. I’d use this toward this toward making a dent on my Amazon wishlist. Oh, my gosh, what a generous offer! I would use it for some cute dishes or pans for my blog!! I actually have something I’ve been wishing for for a long time! Or I might use it for some help in my yard and gardens at home – I’ve been staying with my folks helping out and they are an overgrown mess!! I love that chest.Thanks for the great pic. I love the banner. I am in the process of finishing my entry hall and can’t wait to do a banner like this on my new “mantel” shelves.